Now juniors who are remote to the metro-Atlanta area can receive the same training program on-line as our Frazier Cycling Juniors. Frazier Cycling has been successfully developing junior cyclists for 10 years. 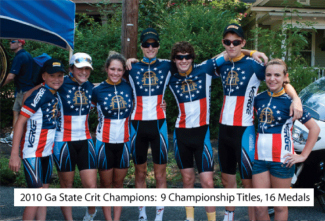 Nationally recognized as the experts in junior cycling, their coaching program has a proven track record of developing national champions. Using the same program that that has taken the Frazier Cycling Junior Race Team to 6 national titles and 32 national medals, Frazier Cycling has designed an on-line coaching program specifically for juniors. The On-line Juniors Program includes a training plan calendar/schedule with personalized daily workouts including descriptions, durations, and intensities, with periodic testing. The athlete is expected to maintain daily logs (electronic) via Training Peaks, which are analyzed by our coaches (testing is conducted by the individual, i.e. self-test). Test Analysis includes an assessment with recommendations for performance improvements and any necessary training modifications. Statistics for training, testing, and racing including mileage, speed, heart rate data, power, performance analysis, and progress charts are maintained. Program with the use of a power meter (such as CycleOps PowerTap, SRM, Quarq CinQo, etc. ): $150/month. There is a 3 month min. Program without the use of a power meter (calendar/schedule with training plan): $100/month. Call us at 770-513-8640 for specific needs and more information including athlete goals, activities, and availability.